Columbia Housing Authority’s goal has not changed since its 1934 founding – it works to provide affordable homes for city and Richland County residents. 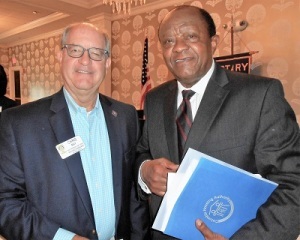 That mission was explained by executive director Gilbert Walker, guest speaker for Capital Rotary’s Oct. 3 meeting. Walker (at right in photo with Rotarian Chris Ray) said 7,000 families – about 28,000 people – make up the authority’s current tenants list. Housing costs range from $50 to about $1,500 monthly, depending on financial ability. Walker said authority income includes federal funding, tenant rents and returns from investments. Columbia Housing Authority is the nation’s third-oldest organization of its type, the biggest in South Carolina and the largest local provider of seniors housing. Redevelopment of the 1940s-era Gonzales Gardens site – vacant since Gardens demolition last year – is expected to begin this November. Walker said the project will create an impressive “gateway for the city and Richland County.” Redevelopment proposals include single family houses, midrises for seniors, garage townhomes, mixed-income rentals and a community center/museum. Despite its success and ambitious plans, Walker said the authority sees unmet needs – a waiting list of 15,000 people seeking homes.